There are a few must-have tools that I always keep with me when decorating both for clients and in my own home. You can save so much time and frustration just by having the right tools to complete a job! No matter your decorating expertise, I think anyone can use these items to make their life a little easier and their home more pulled together. Take a look at my what’s inside my decorating toolbox below! You can click on any item to shop it and I’ve listed more details about how I use each one below! 1. Rug Tape: I have tried several different brands and this is by far the best! Just what you need for keeping the edges of your rugs down and perfectly in place! This prevents lighter weight rugs from sliding and works on tile or hardwood. I’ve used it on just about every rug in my house! 2. Hang-O-Matic: My secret weapon for hanging any piece with that dreaded double hanger on the back! This is a must have for installing gallery walls quickly and easily. It has a level on top of a ruler (genius) and two sliding markers that you can use to mark the exact spots for your nails or screws. 3. Handheld Steamer: Not just for laundry, handheld steamers are also perfect for curtains, bedding, and slipcovers! If you’ve ever washed any of these items, or gotten them brand new from a package, they were likely filled with wrinkles! This makes them look good as new and you don’t have to worry about carting around the parts of a full size steamer! 4. Laser Measurer- I love this for quickly and easily measuring spaces! Just point and click to measure with the laser and you can also store measurements with it. 5. Drill- Probably the most used item in my toolbox and a must-have for decorating! I’ve had a couple drills over the years and Dewalt is by far my favorite brand. 6. Drill Bit Set- Be sure to grab this drill bit set to go with your drill! It has a magnetic drill bit holder that makes switching bits SO quick and easy and it also has all the basic sizes of drill bits that you will need. 7. Staple Gun- Great for easily reupholstering items yourself! This version is powerful enough to use even with thicker fabrics and comes with the right staples too! 8. Wet Dry Vac- Ok I lied, this is definitely my most used item. I’m a nerd because of how much I love my wet dry vac! Once you vacuum with this thing you won’t want to use anything else, especially if you have pets. It’s just so much more powerful than a regular vacuum and I love to use it to vacuum my couches, under furniture, on my covered porches, etc. This one comes with a cart that makes it easy to maneuver and it has plenty of different attachments too. 9. D-Ring Assortment- I use these all the time for hanging wall decor that doesn’t have any kind of hanger on the back or has a hanger that’s too difficult to deal with! I just screw them right into anything I need to hang using my drill (they come with screws as well!). 10. Level- Again, a must have for hanging any kind of wall decor. I just use a basic version and it’s never let me down. 11. Command Strips- I don’t necessarily like to use these to actually hang things but I do use them often to secure items on the wall so the won’t get moved or crooked over time (especially if you have a picture hanging from a wire!). I just place a small strip on the back bottom of my frame, check that it’s level with my level, then push in to secure. 12. Stud Finder- Another must-have for hanging heavier wall decor. If you can find a stud, you won’t have to use an anchor and can get a much more secure hanging. 13. 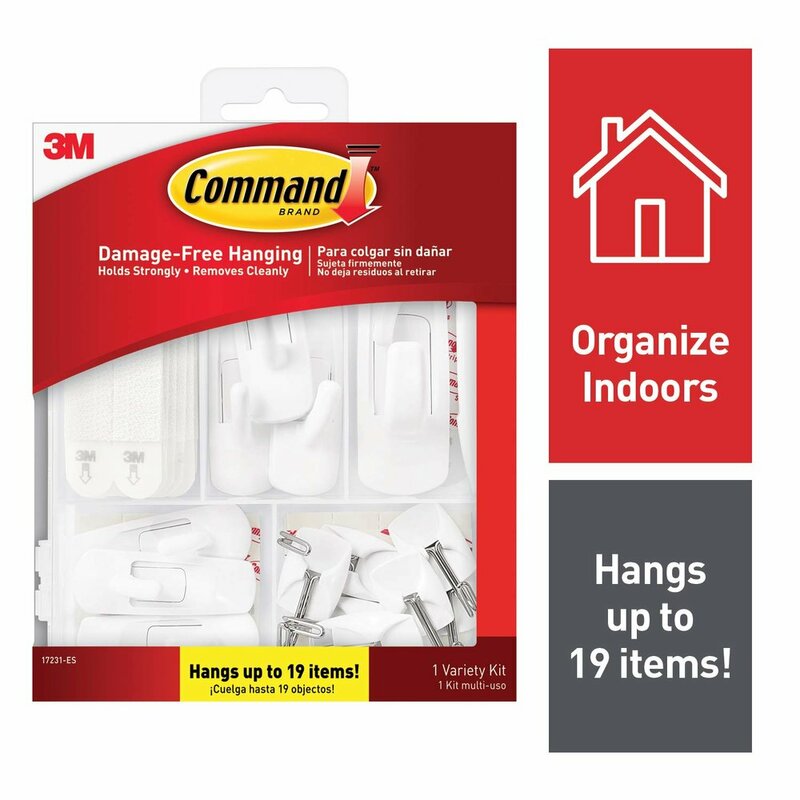 Command Hooks- These are great for using for garlands on fireplaces, wreaths on mirrors/windows, or anywhere that you don’t want a permanent hole or hook. I like this variety pack because it has all different sizes and shapes. 14. Cup Hooks- I use these a lot for hanging garlands, wreaths, plant hangers, mugs, lights, and so much more! I like the gold because it still looks decorative and matches a lot of my brass accents, but these also come in white, black, and bronze too.